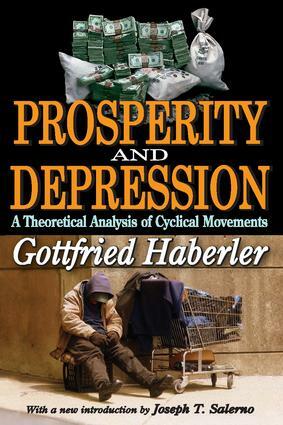 First issued in 1937 and then revised in 1957, Prosperity and Depression focuses on the task of analyzing existing theories of the business cycle and deriving a synthetic account of the nature and possible causes of economic fluctuations. The application, as far as possible, of quantitative tests to the various causal hypotheses - influences the manner in which the problem of economic cycles is approached in Haberler's book.The first part on ""The Systematic Analysis of the Theories of the Business Cycle"" gathers various hypotheses of explanation, to test their logical consistency and their compatibility with one another and with accepted economic principles. It gives a well rounded picture of the possible explanations of economic fluctuations. The second part, ""Synthetic Exposition Relating to the Nature and Causes of Business Cycles"" argues that there are many points where no definitive solution can be proposed, but have a number of possibilities. The choice between these can then be made only on the basis of empirical investigations.Haberler argues that theoretical reasoning supported only by broad facts as one happens to know without special statistical or historical investigations can create intelligent questions, but it cannot definitely answer them. By analyzing various theories and explanations of the business cycle, this book clarifies a number of issues presupposed. The difference between the theories analyzed is not as complicated as is sometimes believed. In fact it is shown how theories which seem prima facie to contradict one another can be reconciled. David Felix's new introduction underlines the continuing importance of this classic.